Update 7/24/16: The promotion period has now ended. After Oil is back to full price. Thanks to all who picked up a copy. Attention everybody, to coincide with the release of After Oil 4: The Future's Distant Shores, the fourth volume the popular After Oil series, we at Founders House decided to offer the ebook editions of After Oil: SF Visions Of A Post-Petroleum World at a limited time promotional price. 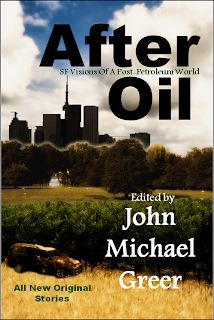 Author John Michael Greer, host of the blog "The Archdruid Report," a weekly peak oil blog, brings together twelve original tales selected from among his readers. Each story offers glimpses into possible futures where oil scarcity and lower energy availability spell the end of modern industrial society.